Nowadays, floriculture growers start their crops using either plugs from seeds or rooted cuttings (also called liners). Growers that use plugs either grow the plugs themselves or buy them from other growers who specialize in plug production. Regardless of who produces the plugs, the objective is to have a healthy seedling in each cell of the plug tray. In order to achieve that, growers have to buy seeds of the highest quality possible and then follow appropriate germination procedures (right temperature, light, water, fertility at each plug production phase). Doing otherwise, represents a loss of money. The extent of such loss depends on the number of non-usable plugs per tray and the wholesale price of each plug (Table 1). Table 1. Potential losses for a 512 plug tray (after Paul Karlovich, Raker’s Acres). Although prices change over time, this table clearly indicates that even the loss of a few plugs per tray represents a loss in revenue. Take home message No. 1: Use high quality seeds and follow appropriate germination procedures. Seed viability indicates to which degree the seeds are alive. Sometimes, seeds are alive but do not germinate even when placed under ideal germination conditions. In such case, it said that seeds are dormant. Germination will occur only when what it is inhibiting germination disappears. Hence, seed viability ≠ seed germination. Seed germination is the emergence and development of the essential structures (root, hypocotyl, cotyledons) that will produce a normal plant under favorable conditions. Reporting the germination potential (expressed as percent germination) of a seed lot is a legal requirement (by law, seed producers must provide this information on packets) and it is measured under ideal germination conditions (in the laboratory) that should be easily replicated. In other words, the germination % of a seed lot measured by two different laboratories should be the same. Having a seed lot with a low germination % is a sure indication of germination problems. But having seeds of high germination % is no guarantee of a good crop of seedlings. How is this possible? Because growers are more interested in seed vigor than germination percentage. Seed Vigor can be defined as the seed properties which determine the capacity to produce a rapid and uniform emergence of normal seedlings under a wide range of greenhouse (as opposed to laboratory) conditions. It is not a legal requirement and each company can develop its own system to measure seed vigor. Take home message No. 2: Viability does not equal Germination, and Germination does not equal Vigor. If a grower objective is to produce plug trays with 100% of the cells having a seedling, seed vigor is paramount. Seed vigor depends on the genetic characteristics of the seeds, storage conditions, and age of the seeds. Seed laboratories can use different tests to determine seed vigor: 1) Cold Test, 2) Accelerated Aging, 3) Electrical Conductivity, 4) Seedling Vigor Classification, and 5) Seedling Growth Rate. Some seed companies have developed their own methods like the Ball Vigor Index. Why should growers pay attention to seed vigor? 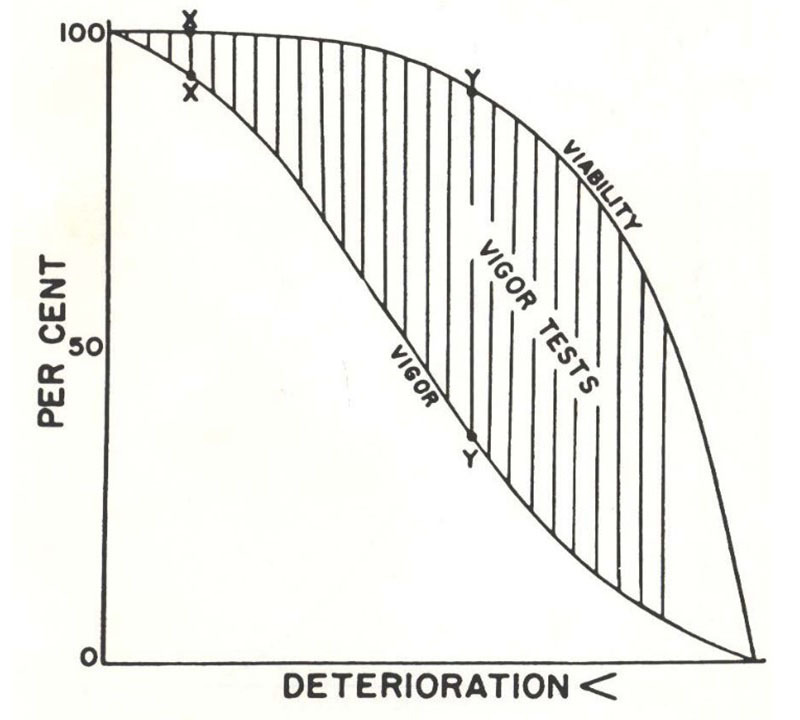 As shown in Figure 2, during storage, seed vigor decreases faster than seed viability (or germination). In other words, the ability of a seed to produce a quality seedling (plug) decreases faster than the ability to germinate. 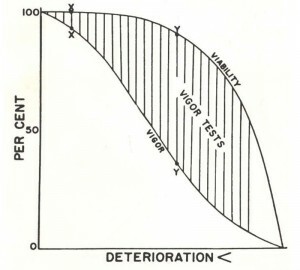 Seed deterioration. It is inevitable, irreversible, and variable. Depending on how seeds are managed after harvest and stored, the best we can do is slowdown seed deterioration. Seed storage. Growers have to take into consideration two factors in relation to seed storage: Temperature and Moisture Content (in turn, a function of air relative humidity). Figure 3. 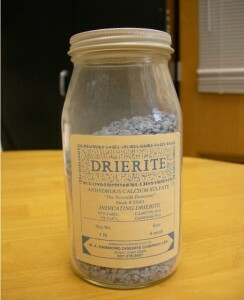 A glass jar containing a desiccant made of particles granules of calcium sulfate (97%) and cobalt chloride (3%). Seed moisture content. In general, if the air relative humidity is between 20 and 40 %, seed moisture content is around 5 to 8%. If seed moisture content is above 5%, seed vigor may decline; above 8%, seed deterioration increases; above 12%, the seed may be attacked by fungus and insects; above 25%, the germination process starts. Temperature. In general, temperature for storage should be between 4 °F and 70 °F; the most common is around 42 °F. At lower temperatures, seeds may not be respiring as much as they do at warmer temperatures. It is important to remember that air temperature influences air relative humidity. A reduction in air temperature produces an increase in air relative humidity. The air relative humidity of working areas such as seeding rooms is usually between 70 % and 80 %. A seed exposed at this relative humidity for two hours can increase its moisture content up to 2%. Take home message No. 3: Keep seeds cool and dry! “Rules of thumb” regarding seed storage for seeds between 5% and 14% moisture content. 1) For every 1% reduction in seed water content, the seed life doubles. 2) For every 10 °F decrease in storage temperature, seed storage life doubles. 3) Practical seed storage equation: % RH + °F ≤ 100. Seed stored at 75% RH and 45 °F = 120 (75 + 45 = 120). These conditions are unacceptable and will favor seed deterioration. Seed stored at 40% RH and 45 °F = 85 (40 + 45 = 85). These conditions are acceptable for seed storage. Seed storage. 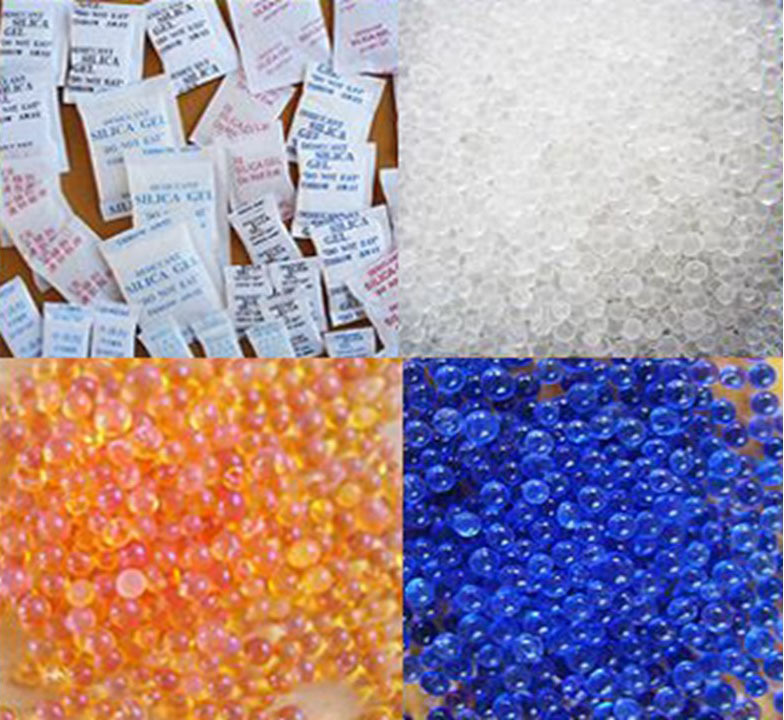 Seeds should be stored in a water proof container having a desiccant (Figures 2 and 3). This container should then be stored in a refrigerator. Growers’ best practices regarding seed handling and conservation. 1) In general, growers should avoid storing seeds from one year to another. Determining seed needs one year in advance (as much as it is possible) assures the availability of the desired seeds, and provides seed companies time to test seed lots. 2) As much as possible, order seed quantities to fit each sowing. Receive seeds in small containers/packages so that, when a container is opened, all its seeds are used instead of having to store the leftover seed. Re-store seeds from already opened containers in containers that are air-tight and with desiccant. Take home message No. 4: Follow seed handling best practices! Finally, keep in mind that the majority of seeds of floricultural crops have short to medium storage lives. Only a few can be stored for long periods (Table 2). Table 2. Relative storage life of flower seeds. Note that only fewer crops have a long storage life. Registration is now open for the OSU Greenhouse Management Workshop!